Here’s something fun for quilters living around my area of NC! I have two quilts in the I Am Woman exhibit at the Southern Arts Society gallery in Kings Mountain, NC. Even better, Dream Goddess won second place at the show! I love seeing this quilt on display so you can see the back and front. Jump ahead to time: 34:00 to listen to the podcast topic. Jump ahead to time: 21:55 to get straight to the topic of the podcast. Have you ever started something and thought it would go one way, only to find it went a completely different way? That’s kinda how I feel about this podcast episode! 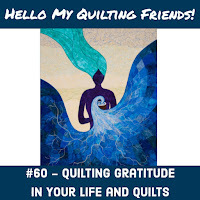 I shared news from the week as I traced a new goddess quilt onto freezer paper and talked a lot about the quilt design, working with leather with my son, and goals of creating with him every weekend. Enjoy!